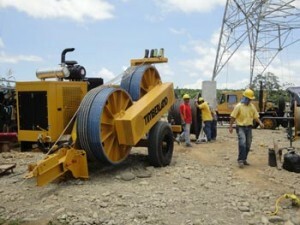 To string lines of two bundle per phase conductors along with optical ground wire in Costa Rica, the Instituto Costarricense de Electricidad (“ICE”) commissioned a PT90-2H/2DD model puller-tensioner from Timberland Equipment. The design of the trailer-mounted puller tensioner had to provide for towing the system at highway speed with hydraulic surge brakes and highway lighting. Timberland was also required to provide one week of Spanish-language training for operators and service technicians. Initial feedback from client is that they are very impressed with the control of the unit and its ease of use.